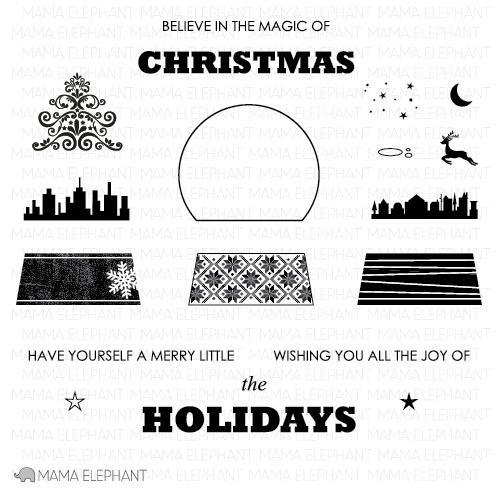 Welcome back for another day of highlighting the newly released Mama Elephant stamps! Today, we are showcasing Believe in Magic ! Even though the snowglobes practically make themselves with these stamps, today I wanted to try something beyond the globe! This set has so many other cool little element stamps! To create a winter starry night, I masked off the rectangle around the stamped cityscape. 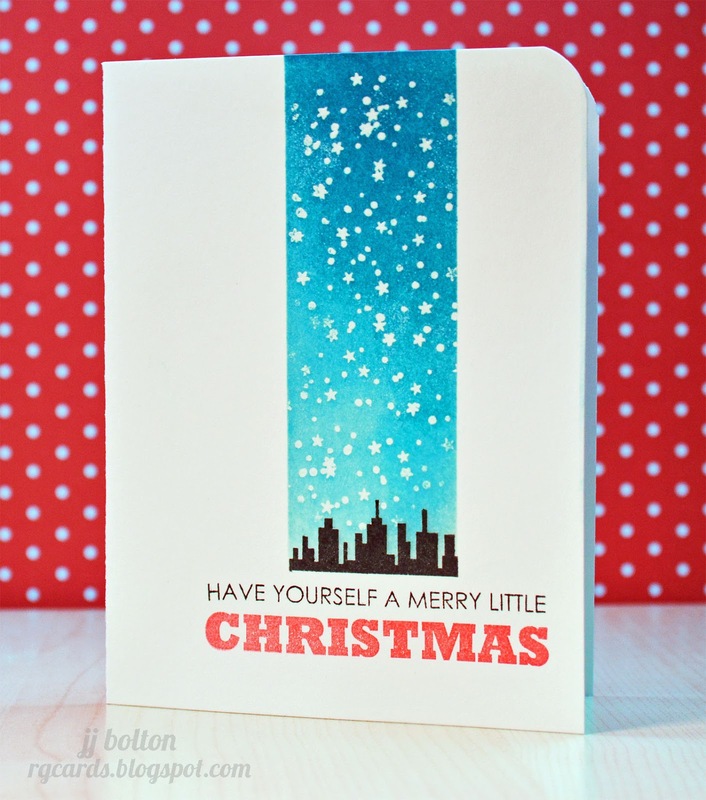 Then I stamped and clear heat embossed the star + snow stamp multiple times all the way to the top of the card. The last layer is the blended blue inks from light (at the bottom) to the dark (on top). Such a fun and easy one-layer card! Fantastic card JJ, I love your sky and the city silhouette! Love how you used the elements from the stamp set to create this design! omyawesomeness! I love the varied blues, and the snowy starfall (starry snowfall? lol) is so magical :) Love the pop of red in the sentiment too! This is gorgeous! I love the starry night cityscape....SO pretty! love the shades of blue skyline. gorgeous card. Fabulous card! Love the shades of blue in your starry sky - the cityscape silhouette is awesome against that backdrop - and the pop of red in the sentiment completes this WOW card. TFS! Another clever use of masking!! HI JJ! Love the blue and red together and that sky full of snow and stars you created over the skyline! Stunning! Love your card! Such a clever way to use the little stamps in this set! Absolutely stunning! The color really makes this card stand out. This is gorgeous. I love your technique for the sky. SEE???? This is what I'm talking about!!!!!!!!!!! AMAZING! I love the sky with the snow and stars! FUN design!!! Another jaw dropper. Love your fabulous masking, JJ. Hope all is well with you! So cool JJ! Love the masking on this!